Golden liquid with hints of walnut, honey and vanilla. The quote above sums up our life here in the country fairly accurately. When we lived in the city it seemed we were just existing. The routine was get up, work, come home and go to bed. Rinse and repeat. That’s existing, but is it living? From experience, I have to say it is not. Let the toasted nuts soak overnight. Moving to the country has had several benefits. Yes, we are slightly “cut off” from the hurly burly but it’s close enough if we want it. Only 1.5 hours away. Technology has made it so I can work for anyone from here as well, when it works... But that's a different story. What country life has afforded us is the chance to live closer to the land and experience the joy of the seasons. It’s amazing how one thing in nature follows another, and rather quickly I’m finding. A prime example is our vegetable garden, but wild plants and our flower beds are teaching us lessons as well. They're all useful in their own ways too. Food doesn't just come from the grocery store if you know what you're looking at. I’m still working on the life/work balance I had hoped to find. It seems to be either feast or famine, but it will come. It's hard not to worry a bit when I'm not busy every day, especially when there was no end to the work when I lived in the city. There's plenty of things to occupy my time here, and I am a little slothful about getting some going. But when I do have “down time” I can afford myself the luxury of working on projects that I want to work on. I can experiment to my heart's content. 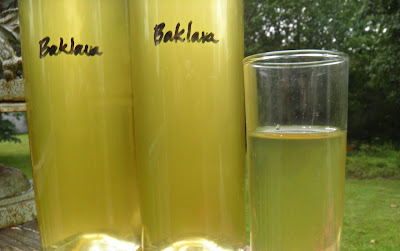 Baklava liqueur is a good example. My first attempt at this was almost two years ago now. It seems to be a completely different lifetime. It was very good, but I wasn’t completely happy with the result. it was a bit cloudy. This is a liqueur that is made to taste like the famous Greek dessert, baklava. You know, walnuts, honey, phyllo pastry... It turned out quite well, except for the opacity. 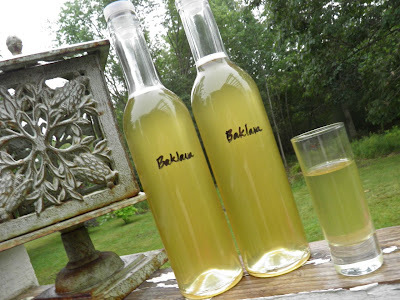 The original recipe called for a 2-week infusion time and the end result was a bit cloudy. At the time I blamed it on the honey, but that may or may not have been the reason. I believe it had something to do with the nuts – fine pieces of nut “dust” that I couldn’t get out. 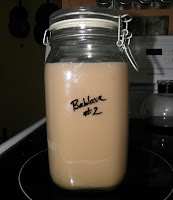 I’ve been making nut (and soy) milk lately and have found that is a way to really extract nutty flavour quickly. If I used that knowledge I could perhaps infuse a little more nuttiness into this liqueur AND cut down on the cloudiness. So that was my departure point. The first step was to make walnut “milk” – an easy thing to do. Step 2 was to use that milk as the liqueur base. A fact of homemade nut milks is that they separate. They have no stabilizers to keep the fine nut particles in suspension so they separate. 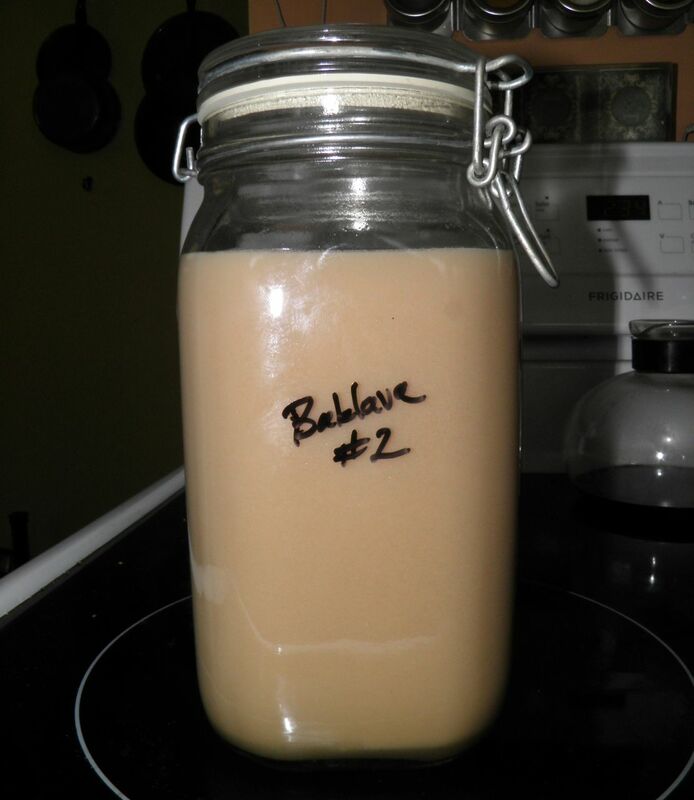 A quick shake fixes that for milk, but it’s undesirable to have it in a liqueur. So in the refrigerator the liqueur went – for 1 week. At the end of the week it has separated into a golden bottom and a light brown layer of nut particles. Skimming off that layer with a spoon got rid of most of it. Dripping the mixture through a cloth lined jelly bag finished the job. I’m quite proud of the result. The end result is a liqueur has the taste of baklava distilled into a honey, golden liquid. I don’t believe anyone else has tried to make a liqueur that tastes like baklava. That’s OK. I’m perfectly happy to claim this as my own. Time: 1 week | Yield: about 850 ml | about 15% alc./vol. jelly bag lined with cotton cloth. Toast the walnuts in a dry pan until they become fragrant. Take care not to burn them. 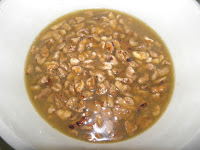 Soak the walnuts overnight in the water. In the morning purée the mixture. 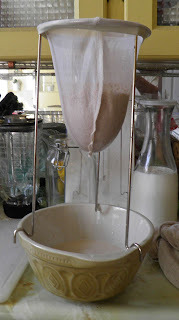 Squeeze the resulting mixture through a fine cloth, or jelly bag, to remove the solids and make walnut milk. Dry and reserve the nut meat for another use. Place the milk in a medium stock pot. Add the cinnamon stick, vanilla and honey to the pot. Bring to a boil, reduce the heat and simmer for 10 minutes. Set aside to cool. 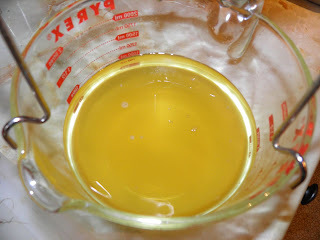 Add the vodka, and enough liquid to make about 1L and place in a jar. Refrigerate for 1 week. During this time, a brown layer of fine walnut “dust” will float to the top. After the week, skim off as much of the sediment as you can with a spoon or ladle. Using a jelly bag lined with cloth (or similar fine cloth drip set-up), strain the liqueur again. 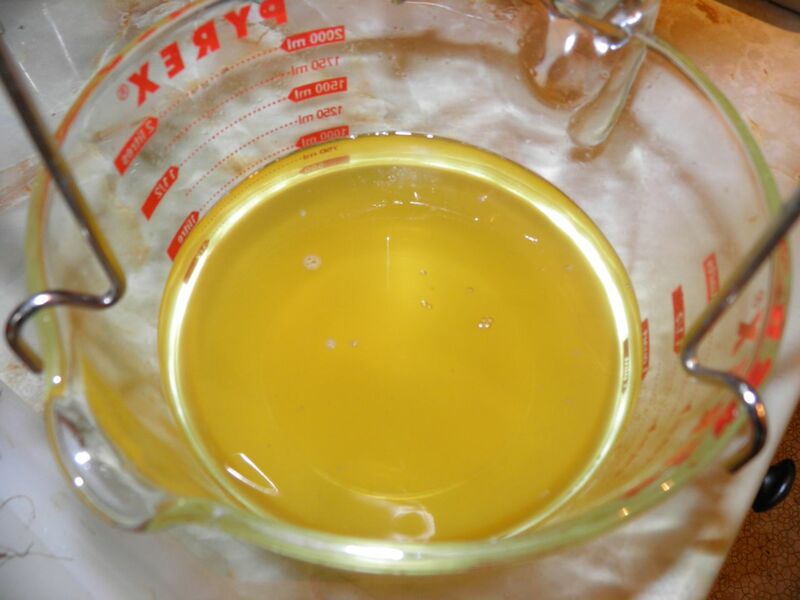 The result will be a nearly completely clear, golden liquid. Place in clean, sterilized bottles. I find this liqueur is at its best served slightly chilled. Good to hear things are going well in the country! Keep on living - Love these recipes. I've been stepping up my game in the kitchen as well. Keep the recipes coming - I love them. Have you attempted a Drambuie-style whisky-based liqueur yet? That's my current goal. I haven't tried Drambuie. I've infused whisky but never scotch. "Fireball" is pretty easy to make with whisky and lots of cinnamon, either with a syrup or without, so Drambuie should be a snap.